4s & 3d, 3d & 4s, Cu & Cr, sloppy Aufbau & Eric Scerri! Yeah, that’s an inelegant title to say the least, but behind it is an elegant piece of chemistry that is struggling to get recognition. Yesterday I had the enormous pleasure and privilege to chat with UCLA chemistry professor and venerable author and expert on the periodic table, Eric Scerri. Eric and I chatted about a number of things, and I was delighted to find that he and I share more than just an English education in common. Amongst our connections is the fact that we both previously taught in the London tutorial college sector – fascinating stuff! Anyway, I digress a little and wanted to focus here on just one of the topics that came up during our discussion. I have to be honest and admit that I feel a little embarrassed. I did not know anything about the controversy of what Eric christens, ‘the sloppy Aufbau‘. In order to fully understand the 4s/3d problem that Eric discusses, you should absolutely go and read the full text of Eric’s blog post on the matter. Any AP chemistry student, or indeed even any high school student who has knowledge of orbitals and electronic structure, should be able to follow it without too much effort, but in order to (hopefully) aid that process, the remainder of this post is my attempt to summarize the essence of Eric’s position, and the work of others in the field like Eugen Schwarz who has championed these ideas for a number of years. 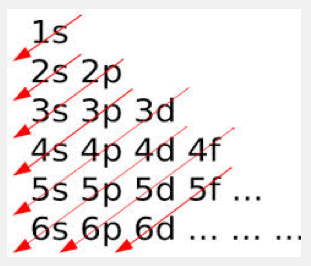 Traditional teaching surrounding the electronic configuration of the first row transition elements (including my own) tells us that the 4s orbital is filled first, followed by the 3d, becasue ‘the 4s orbitals are of lower energy‘. It goes on to tell us that the 4s electrons are lost first when it come to transition metals forming ions, often accompanied by a justification that might include reference to them being ‘farther from the nucleus‘. That explanation is problematic of course, since stability, not distance, must be the driving force. Many teachers (but not me I might add), are in the habit of packaging this nicely in an aufbau diagram that allows kids to follow the sequence of orbital filling and therefore to achieve the ‘correct’ electronic configuration of the first row transition metal elements. Of course, even though this does yield the correct overall configurations ultimately, this treatment also introduces an nasty inconsistency, since in teaching that apparently lower energy orbitals (4s) are emptied first, makes little sense, or at the very least it introduces a somewhat problematic contradiction. Eric goes on to tell us that the usual reasoning that is offered for the anomaly of filling the 4s orbitals first becasue of their ‘lower energy’, is actually entirely incorrect, and in reality the 3d orbitals ARE of a lower energy than the 4s, and what is more, they (the 3d) ARE in fact, filled first! It is also consistent with the (actually higher energy) 4s, being the first to empty. Scerri suggests that the essence of the problem lies in the pursuit of convenience, which trumps the truth! He points to the ‘sloppy Aufbau’ diagram is helping to perpetuate the incorrect model, since it coincidentally actual ‘works’, in as much as it does correctly predict the electronic configuration of the first row of transition elements (with the exceptions of Cr and Cu). Eric’s post tells us that the reality of the situation is that the 3d orbitals ARE indeed filled first, but that in many cases, electrons in the lower energy 3d orbitals are promoted to higher energy 4s orbitals. Although Eric doesn’t say as much or even imply it, to me, if the promotion happens to involve two electrons being shifted into 4s, this gives the impression that the 4s was filled first. The, ‘3d first followed by promotion to 4s’ model, is apparently justified by numerous pieces of research, experimental evidence and reputable papers on the subject, but has not gained the traction that it might have in college level texts (not that I, as a humble high school level educator, pretend to understand the inner machinations of how even peer reviewed chemistry research becomes mainstream). The ‘3d first’ idea is explained by considering a number of ‘simple in principle but tricky in practice‘, Coulombic forces. The complex electrostatic interactions of the nuclei and electrons (and indeed of electrons and electrons), the different physical 3D shapes and sizes of the s and d orbitals, and the associated math, taken together actually lead to an energetically more stable situation when lower energy 3d electrons are promoted to higher energy 4s electrons. Because those interactions are complex and varied, the degree to which 3d electrons are promoted to 4s orbitals is inconsistent amongst transition elements, and there is no convenient, easily predictable pattern. This means that all kinds of weird stuff that the sloppy Aufbau might not anticipate, do indeed occur. Examples such as the Cr and Cu oddities, and as Eric points out, Palladium, kind of screw up the ‘system’. The 3d before 4s explanation is beautifully consistent with the formation of transition metals ions by the loss of their 4s electrons, first. This view also removes the need to even consider chromium and copper as exceptions to the rules, and replaces that ‘exceptional’ idea with one that says ALL of the transition metals are ‘exceptions’, and as such that rearrangement ‘exceptions’ aren’t that at at all, rather they are the accepted, normal state of affairs. In short, exceptions ARE the rule! Happily for me, I have not once used the Aufbau diagram in my 23 years of teaching chemistry. The reason is simple, I was never taught to use it! This ties in nicely with another part of our discussion yesterday, where Eric noted that there are many differences between the way chemistry is presented in the England and the US. For Eric and I, with extensive experience of teaching in both countries, such observations are pretty interesting. Anyway, why am I writing about all of this? Well, for a number of reasons but one of them is because in the new AP chemistry curriculum, the need for students to know the chromium and copper ‘exceptions’ (p. 20 of 172) has been removed, and in addition PES has been introduced. 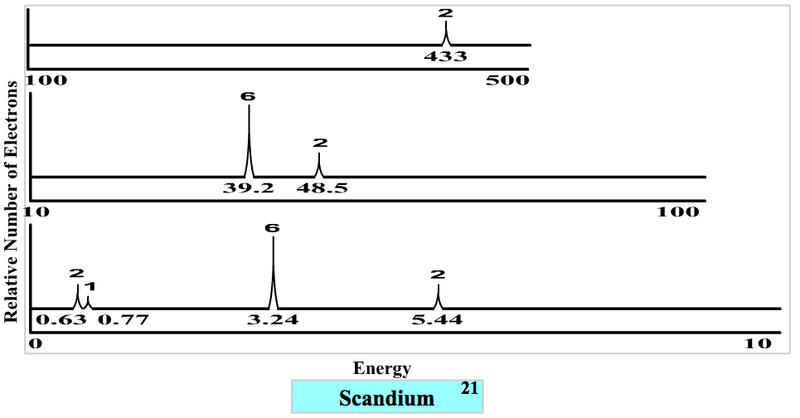 As expected, the PES plot for Scandium shows that the 4s electrons are (slightly) easier to remove (0.63 eV) than the 3d (0.77 eV), but with the ‘sloppy Aufbau’ exposed, we now have no need to ‘explain away’ why this happens. It happens (logically), because the 4s is actually of higher energy than the 3d! The ostensive reason for removing the need to know about copper and chromium as exceptions, is that the AP is trying to move away from rote learning, but all of this has intrigued me, and I wonder if it is actually related to the ‘sloppy Aufbau’, and an attempt to move away from it. For now I doubt it, and until the AP exam moves away from simply predicting electronic configurations or toward more complicated explanations that the sloppy Aufbau cannot cope with, I suppose we are stuck with the ‘4s fills first and empties first’ and ‘half-filled orbitals are more stable’ – we’ll see. A shame, since for me, the theory advanced by Eric and others doesn’t seem that complicated to teach or to understand., even at the AP level. So basically what happens is that, due to the repulsion from the one electron in the 3d sub-level, the next two electrons are promoted into the 4s sub-level (except in the case of Cr and Cu) and then once the 4s sub-level is full, the 3d sub-level is then filled? In effect, the 4s sub-level is completely filled after one electron goes into the 3d sub-level, so it is kind of correct to say that the 4s sub-level completely fills before the 3d sub-level (except in those two examples)? Basically, Eric summarizes things here, in the paragraph with the sub-heading, “What’s really happening?”.